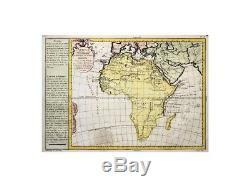 Africa Old Antique Map Africa Veteribus Nota Philippe 1787. 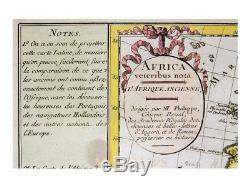 Description: Africa Continent Old antique 18e century map with Madagascar and Canary Islands. Left column with notes and description. The map is copperplate engraved with hand coloring. Origin: World atlas for the study of geography and ancient and modern history, Paris 1787. 16th -17th -18th-19th Century maps & atlases & prints. We sell guaranteed Absolutely Original authentic Maps and Prints. A Certificate of Authenticity (COA) will be supplied on request. 15.5 x 11.5 inches. 13.5 x 10.5 inches. Condition: Nice map in good condition, center fold as published, page marked No. All maps and prints are genuine, authentic, published at the date stated in this listing! Always real antique maps - Always original - Never reproductions. For better quality pictures please go to our web site. All maps and prints are genuine, authentic, published at the date stated above. 3 day's Global Express Courier Services on request. The item "Africa Old Antique Map Africa Veteribus Nota Philippe 1787" is in sale since Tuesday, December 25, 2018.